Marden Nichols (Ph.D. University of Cambridge) was at the Walters Art Museum from 2011-2013 as Assistant Curator of Ancient Art. She is a classicist, whose research focuses on the literature, art and culture of the Roman republic and early empire. Her monograph Vitruvius on Display: Domestic Decor and Roman Self-Fashioning at the End of the Republic is forthcoming from Cambridge University Press.Recent articles discuss ancient Roman domestic decor and the moral discourse of luxury, the authorial personae of Horace and Vitruvius, the satirist Persius, and the reception history of plaster cast replicas of classical art. She is currently an assistant professor at Georgetown University. In the past two decades, Roman domestic art and architecture has become a lively field of scholarly inquiry. For the ancient Romans, the house was not merely a private space for interacting with family and close friends, but a nexus for a wide range of social rituals and activities. As such, the topic of the Roman house rewards interdisciplinary approaches drawing on methods from classics, archaeology, history of art, and museum studies. The students and faculty of the “Roman House at Hopkins”. From left, Nicole Berlin, Laura Hutchison, Adam Tabeling, Herica Valladares, Marden Nichols, Betsy Bevis and Michele Asuni. Not pictured, Laura Garofalo. During the academic year 2012-2013, we team-taught a series of two graduate seminars on ancient Roman domestic space. Our six students enrolled in both “The Roman House: Image, Text, Archaeology” (Fall 2012) and “Curating the Roman House” (Spring 2013). The goal of the first course was to investigate the development of Roman dwellings both as physical structures and as potent symbols within Roman literature and culture from the middle republic through the high empire. The second course, a museum practicum, offered an opportunity to develop curatorial skills, including connoisseurship, object-based research, spatial design, and writing for public audiences. This year of focused study culminated in the Johns Hopkins University Archaeological Museum exhibition “The Roman House at Hopkins,” on view from April 14, 2013. 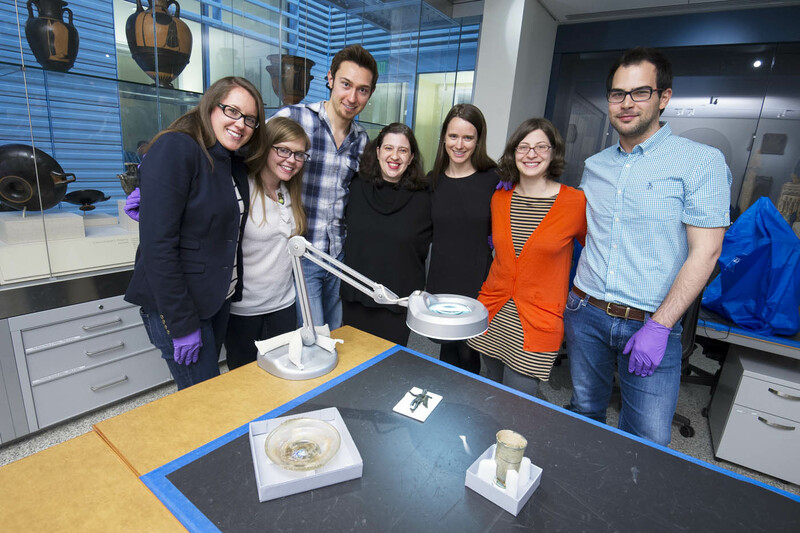 In the seminar “Curating the Roman House,” students analyzed domestic artifacts from the collections of the Johns Hopkins University Archaeological Museum. Mostly unpublished and unprovenanced, these objects presented challenges in their interpretation. Working together, our students designed thematic installations in display drawers within the Archaeological Museum. Each worked on a separate category of objects: ceramic lamps, glass vessels, Arretine ware, bronze figurines, textiles, and what the ancient Roman author Vitruvius called “expolitiones,” i.e. a house’s finishing touches (mosaics and wall paintings). Several colleagues at JHU and other institutions offered much appreciated guidance and assistance in bringing this project to fruition. We offer sincere thanks to Betsy Bryan (JHU), Sanchita Balachandran (JHU), Natasha Jones (JHU), Lisa Anderson (JHU), James T. VanRensselaer and Will Kirk (Homewood Photography). For presentations given by Drs. Valladares and Nichols on the work of this course, please click here.